In 1963, the president of South Vietnam , Ngo Dinh Diem, was deposed by the country's military. At that point, the United States was, as we saw above, deeply engaged in a campaign of emergency military assistance to the regime, although plans were also being made to begin withdrawing U.S. advisers. In the spring of 1963, Buddhist monks began a protest campaign against the Diem government, asking for an end to discrimination. This was met with force and an escalatory spiral ensued, eventuating in several monks burning themselves to death. 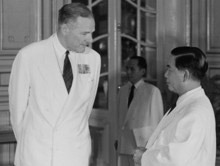 Diem still failed to budge, in spite of repeated U.S. advice to soften his policy; worse, his sister-in-law applauded the monks' deaths and offered to supply fuel for additional such “barbecues.” Finally, after the outgoing U.S. ambassador had departed, Diem declared martial law and sent the army into the Buddhists' pagodas to round up those whom it considered subversive. Washington was now faced with a South Vietnamese president, whom it had put in power and lavishly supported for almost a decade, whose actions were widely condemned by his own people and by newspapers and governments around the world. Even more worrisome was the prospect that the mostly Buddhist “middle level enlisted men” in the South Vietnamese army would at the least be distracted from the counterinsurgency war they were carrying out against the PLAF. Diem: Some units have made a rebellion and I want to know: What is the attitude of U.S. ? Lodge: I do not feel well enough informed to be able to tell you. I have heard the shooting, but am not acquainted with all the facts. Also it is 4:30 a.m. in Washington and U.S. Government cannot possibly have a view. Diem: But you must have some general ideas. After all, I am a Chief of State. I have tried to do my duty. I want to do now what duty and good sense require. I believe in duty above all. Lodge: You have certainly done your duty. As I told you only this morning, I admire your courage and your great contributions to your country. No one can take away from you the credit for all you have done. Now I am worried about your physical safety. I have a report that those in charge of the current activity offer you and your brother safe conduct out of the country if you resign. Had you heard this. Diem: No. (And then after a pause) You have my telephone number. Lodge: Yes. If I can do anything for your physical safety, please call me. Diem: I am trying to re-establish order. 1) Felt, quoted by Hilsman, in White House meeting, “Memorandum for the Record,” 26 August 1963; State to Saigon , 24 August 1963; both FRUS 1961-1963 , vol. 3: docs. 289, 281; Rusk in White House meeting, “Memorandum of Conference With the President,” 29 August 1963; CIA Station Saigon to CIA, 31 August 1963; CIA Station Saigon to CIA, 2 September 1963; Saigon to State, 11 September 1963; Bundy to Lodge, 30 October 1963; Saigon to State, 1 November 1963; all FRUS 1961-1963 , vol. 4: docs. 15, 32, 48, 86, 249, 259; withdrawal plans: “Record, Eighth Secretary of Defense Conference, HQ CINCPAC, Camp H.M. Smith, Hawaii,” 6 May 1963: 4-a-2; Taylor to Chiefs of Staff, 4 October 1963; both Galbraith (2003); Newman (1992: pts. 4-5); Jones (2003: chs. 15-7); Porter (2005: ch. 5). The two FRUS volumes for Vietnam in 1963 are full of discussions about coups against Diem – starting months before the actual coup – by U.S. officials in Saigon and Washington . As regards the issue of assassination, although it is clear that when the possibility was broached by the Vietnamese generals, the U.S. reaction was strongly negative, it is also clear that the U.S. did not go beyond informing the generals that it did not like the idea (to which the response was, “All right, you don't like it, we won't talk about it anymore”; Don, quoted by Conein [U.S. Congress, Senate 1975b: 221 and, for the entire episode, 217-23]); proposal in CIA Station Saigon to CIA, 5 October 1963, FRUS 1961-1963 , vol. 4: doc. 177.